Police in London have shut off Wi-Fi access in some of the city’s Tube stations this morning in an attempt to disrupt action by climate change protestors. So far this week, more than 300 protestors from the Extinction Rebellion group have been arrested in the UK’s capital, targeting main roads, bridges, and Tube stations. The group wants the UK to reduce its carbon emissions to zero by the year 2025, and it has said that civil disobedience and mass protest are the most useful tools to raise public awareness. On Wednesday morning, protestors targeted the Canary Wharf station of London’s Docklands Light Railway, an above-ground light rail system. The DLR is one of a number of rail systems in London, which include the Underground, Overground, and Crossrail. Internet access is not available within the tunnels of London’s tubes, though it is provided at hundreds of stations and on underground platforms via Wi-Fi from Virgin Media. This was what police shut down on Wednesday morning. Extinction Rebellion protestors want the UK to reduce carbon emissions to zero by the year 2025. The spokesperson says the shutdown is ongoing and would be “reviewed throughout the day.” They did not say exactly which stations were affected. Shutting down Wi-Fi at London Tube stations is an unusual move for the British Transport Police. 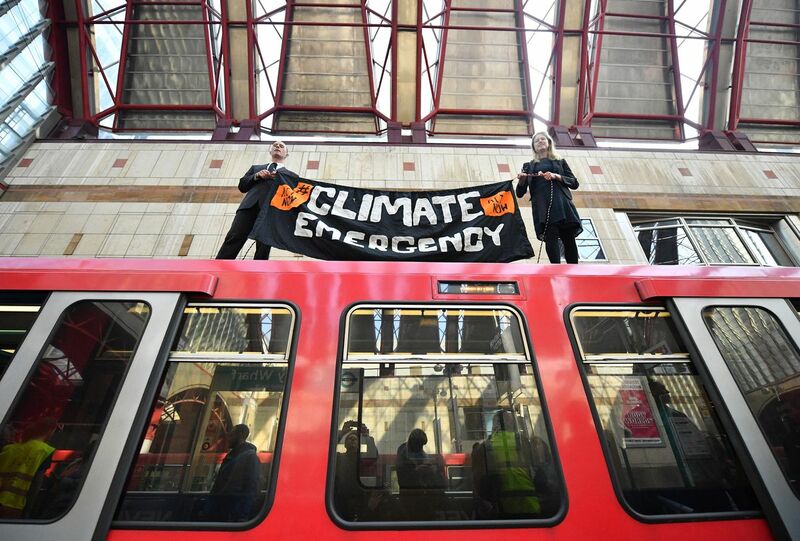 It’s not clear to what degree it would stop climate protestors from coordinating, as the vast majority of DLR stations (the line targeted today by Extinction Rebellion) are above ground and have access to mobile networks. It’s also not clear what procedures police have to follow in order to effect a shutdown. A spokesperson for Virgin Media, the ISP that provides Wi-Fi in London Tube stations said only that the company had received an instruction from the police and had to comply. “Earlier today the British Transport Police instructed that the public Wi-Fi network on the London Underground be temporarily switched off. Connectivity will be restored as soon as possible,” said the spokesperson from Virgin Media.